How do nerve cells maintain synapses with an adequate supply of proteins that facilitate memory formation? Few aspects of aging are more terrifying than memory loss. Given this, elucidating the molecular basis of memory formation currently is one of the hottest topics in scientific research. Since the late 1950s, scientists have known that memories are inscribed in a part of the brain called the hippocampus. It also has long been known that to form long-lasting memories, nerve cells (neurons) must produce specific “neuromodulatory” proteins and deliver them to sites called synapses, where these proteins initiate changes that facilitate neuronal communication and memory formation. Significantly, neurons are long and morphologically complex cells, and they thus face significant challenges to achieving effective delivery of proteins to synapses. Our research is directed at elucidating mechanisms underlying this pivotal process. We address these issues using a combination of experimental and theoretical approaches. 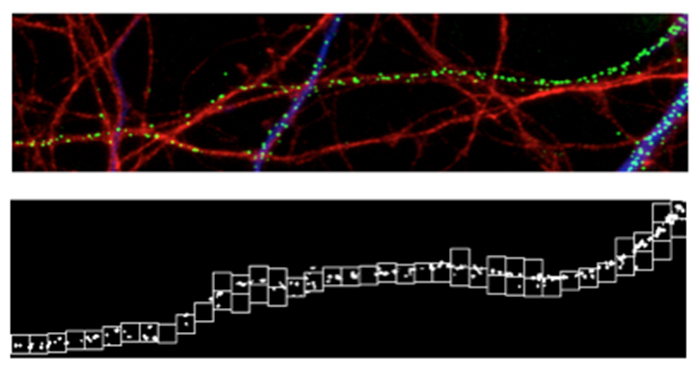 Our experimental work involves direct visualization of protein localization and trafficking in living neurons using fluorescence microscopy (see movie). Our theoretical work involves analyzing data from movies, and from still images, using transport theory, spatial pattern analysis, and related methods (see figure). Using these tools, we have demonstrated that neuromodulatory proteins are widely and randomly distributed in neurons of the hippocampus and are efficiently transported over long distances in these cells via rapid, motor-directed mechanisms. We also have shown that rapid, vesicle-based transport culminates in stochastic (rather than targeted) storage of neuromodulatory proteins in a subset of synapses, where these proteins undergo regulated release in response to stimuli that induce memory formation and learning.